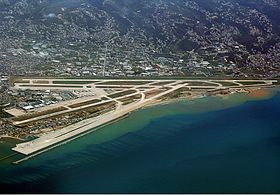 Beirut–Rafic Hariri International Airport (Arabic: مطار بيروت رفيق الحريري الدولي‎, Maṭār Bayrūt Rafīq al-Ḥarīrī ad-Dwaliyy) (French: Aéroport international de Beyrouth) (IATA: BEY, ICAO: OLBA), formerly Beirut International Airport, is located 9 kilometres (5.6 mi) from the city center in the southern suburbs of Beirut, Lebanon, and is the only operational commercial airport in the country. It is the hub for Lebanon's national carrier, Middle East Airlines (more commonly known as MEA). It is also the hub for the Lebanese charter carrier Wings of Lebanon, and was the hub for the Lebanese cargo carrier TMA cargo before its collapse. 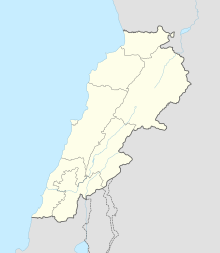 It is the main port of entry into the country along with the Port of Beirut. The airport is managed and operated by the Directorate General of Civil Aviation (DGCA), which operates within the Ministry of Public Works and Transport. The DGCA is also responsible for operating the air traffic control (ATC) at the airport as well as controlling Lebanon's airspace. DGCA duties include maintenance and general upkeep ranging from cleaning the terminal to de-rubberising the runways. The airport opened on 23 April 1954, replacing the much smaller Bir Hassan Airfield which was located a short distance north. At the time of its opening, the terminal was very modern and it featured an excellent spotters terrace with a café. The airport consisted of two asphalt runways at the time. Runway 18/36 at 3,250 metres (10,663 ft) was used primarily for landings from the 18 end while runway 03/21 at 3,180 metres (10,433 ft) was used primarily for take-offs from the 21 end and from the Sami end. 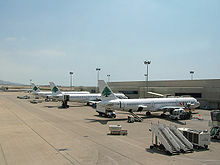 The airport grew to become a premier hub in the Middle East, thanks to limited competition from neighbours, with fast and steady growth by the country's four carriers at the time, Middle East Airlines (MEA), Air Liban, Trans Mediterranean Airways (TMA), and Lebanese International Airways (LIA), and numerous other foreign carriers. In response to an attack on El Al Flight 253 two days earlier in Athens, on the night of 28 December 1968, Israeli commandos mounted a surprise attack on the airport and destroyed 14 civilian aircraft operated by the Lebanese carriers, Middle East Airlines (Air Liban had merged with MEA by this time), Trans Mediterranean Airways, and Lebanese International Airways. This caused serious devastation to the Lebanese aviation industry. Middle East Airlines managed to rebound quickly, but Lebanese International Airways went bankrupt and its employees were transferred to MEA. The airport lost its status as one of the premier hubs of the Middle East with the start of the 15-year-long Lebanese Civil War in April 1975 and lost virtually all of its airline services with the exception of two Lebanese carriers, Middle East Airlines and Trans Mediterranean Airways. Both airlines continued operating with the exception of certain periods of time when the airport itself was completely closed. Despite the conflict, the terminal was renovated in 1977, only to be badly damaged five years later by Israeli shelling during the 1982 Israeli invasion of Lebanon. The airport was the site of the 1983 Beirut barracks bombing, in which 241 American servicemen were killed. The airport's runways were renovated in 1982 and 1984. By the time war finally came to an end in 1990, the airport needed to launch a massive reconstruction program. A ten-year reconstruction program was launched in 1994 which included the construction of another terminal, two runways, a fire station, a power plant, a general aviation terminal, and an underground parking garage. Many structures, like the radar building, were rehabilitated. Inside the airport, with passenger check-in and the entrance to passport control off-camera to the right. In 1998 the first phase of the new terminal was completed. 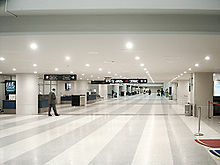 It was located immediately adjacent to the east of the old terminal and consists of gates 1–12. After it was inaugurated, the old terminal was demolished and construction on the western half began and was completed in 2000, however it was not inaugurated until 2002. This consists of gates 13–23. The new terminal can handle 6 million passengers annually and is expected to be expanded to handle 16 million passengers by 2035. It was decided early on that the original runways were no longer sufficient. A new landing runway, 17/35 was constructed protruding at an angle out into the sea, with a length of 3,395 metres (11,138 ft). This seaward protrusion was built in order to move landing traffic away from the city in a bid to improve safety and reduce aircraft noise. A new take-off runway was constructed parallel to the old 03/21 at a length of 3,800 metres (12,467 ft) making it the longest runway in the airport. The old 03/21 was converted to a taxiway for accessing the new runway 03/21. Unlike the old runways, the two new runways were constructed from concrete and feature more advanced lighting systems and instrument landing systems. In 2004, runway 17/35 was re-designated 16/34 and runway 18/36 was re-designated 17/35 after more accurate runway heading measurements were conducted. Despite being essentially replaced by and adjacent to the new runway 16/34, runway 17/35 is still open, although it is rarely used. On 17 June 2005, the General Aviation Terminal was finally opened. It is located on the northwestern corner of the airport. All fixed-base operators and VIP charter providers have moved their operations to this state-of-the-art terminal. In 2005, the airport was renamed from "Beirut International Airport" to "Beirut–Rafic Hariri International Airport" in honor of former Lebanese Prime Minister Rafic Hariri, who was assasssinated earlier in the year. On 13 July 2006 at approximately 6:00 a.m. local time, all three runways of the airport sustained significant damage from missile strikes directed at it by the Israeli Air Force as part of the 2006 Lebanon War. The Israeli Air Force claimed that the airport was a military target because Hezbollah was receiving weapons shipments there. The runways were rendered inoperative and the Lebanese Government declared that the airport was closed until further notice. Shortly thereafter, MEA used one of the long taxiways at the airport to evacuate five of its aircraft (four Airbus A321 and one Airbus A330). The airport reopened to commercial flights on 17 August 2006, with the arrival of a Middle East Airlines (MEA) flight around 1:10 p.m. local time from Amman, followed by a Royal Jordanian flight also from Amman. This marked the first commercial flight arrival at Beirut International Airport since the airport's closure almost five weeks before. All runways and taxiways at the airport have been successfully repaired and the airport is operating as it was before the hostilities. On 7 September 2006, Israel ended its air blockade of Lebanon. The first plane to land at the airport after the end of the blockade was a Middle East Airlines flight at 6:06 p.m. local time. Soon after that, a Kuwait Airways flight landed at the airport. Over the next couple of days, more airlines resumed flights to the airport, including Emirates, Etihad, Jazeera Airways, Air Arabia, Air France, British Airways (BMED), Cyprus Airways, EgyptAir, Air Algérie, Royal Air Maroc, Jet Airways, and Gulf Air. On 6 June 2007, U.S. President George W. Bush amended a ban on air traffic to Lebanon imposed since the 1985 hijacking of TWA Flight 847 to allow flights by the U.S. Government. A press release issued by the White House said that the "prohibition of transportation services to Lebanon...is hereby further amended to permit U.S. air carriers under contract to the United States Government to engage in foreign air transportation to and from Lebanon of passengers, including U.S. and non-U.S. citizens, and their accompanying baggage; of goods for humanitarian purposes; and of any other cargo or materiel.". On 29 March 2018, Emirates operated a one-off Airbus A380 service to Beirut. It was a trial flight in order to test the airport’s handling of the aircraft. The aircraft parked at gate 1, which is capable of handling the Airbus A380. This marked the first time the A380 had landed in Lebanon. The terminal consists of two wings, the East and West Wing, joined together by the main terminal, forming a U‑shaped building, with each wing being parallel to the other, and the main terminal connecting the wings. The modern terminal consists of 23 gates, 19 of which have jetways, two of which are dual jetway gates for large aircraft, and two are bus gates which have been decommissioned. Smoking is prohibited in almost all areas inside the terminal, with a few exceptions (see East and West Wing section below). The ground level, which features the arrival area, and also contains a duty-free section for arriving passengers next to baggage claim. The duty-free shops and baggage area are accessible to arriving passengers after they clear passport control, but before they clear customs (this duty-free, like all the others, is not open to the general public). The general public has access to the waiting area, and there are various cafes and restaurants open to the public. The second level, features the departure level, security checkpoint, ticketing, customs, and immigration. It also includes the primary duty-free shopping area, which is only accessible to ticketed passengers once they clear immigration. There is also a second security checkpoint passengers must pass through before accessing each separate wing. The third level, which houses all of the private airline lounges, prayer rooms, as well as a restaurant with a nice view on the termac. The fourth level, which is closed to the public and passengers, mainly houses the airport administration offices. Each wing contains its own departure gates, as well as two cafés (one of which features a smoking section), a newsstand, a tourism shop, and smaller duty free shopping areas in each wing. The East Wing, which opened in 1998, has gates 1–12 and the West Wing, which opened in 2002, has gates 13–23. Gates 2 and 3 are dual jetway gates for large aircraft. Gates 4 and 22 are bus boarding gates, however these are almost never used. The only way to move from one wing to the next is through the main terminal. The airport also includes banks, a post office, prayer rooms, and a tourist information centre (managed by the Ministry of Tourism). There is Wi-Fi throughout the airport, but it is only free for the first 30 minutes used. All of the lounges except for the Qatar Airways lounge are also Priority Pass lounges. Cedar Lounge, owned and operated by Middle East Airlines. It occupies half of the available lounge space at the airport. The Cedar Lounge opened on 1 August 2005, and was refurbished in 2017, and extends over an area of 3,000 m², with a maximum capacity of 300 seated passengers. The lounge has various seating areas, an enclosed smoking area, a business centre, a children's play area, a bar, and a self-service cafeteria. It is open to MEA passengers with business class tickets, and to first and business class ticket holders from select airlines, including (but not limited to) Air France, Emirates, Kuwait Airways, Alitalia, Qatar Airways and Saudia. Beirut Lounge, operated by Middle East Airlines. Open to their credit cardholders and premium passengers of Lufthansa, Aegean Airlines, and others. LAT Lounge, operated by the ground handler Lebanese Air Transport. Open to most other airlines' premium passengers that are not allowed into the Cedar Lounge, including (but not limited to) British Airways, Iran Air, Aeroflot, Air Serbia, TAROM, flydubai, Turkish Airlines and Ethiopian Airlines. Ahlein Lounge, also operated by the ground handler Lebanese Air Transport, is their higher-end offering. This lounge opened in December 2018. Qatar Airways operates its own lounge at the airport on Level 1. Passenger use and aircraft movements have increased each year since 1990 with the exception of 2006, which saw a sharp decrease in both. Total cargo has trended upwards since 1990 but also experienced a significant decrease in 2006. The airport has a three-level car park with a total capacity 2,350 cars. Public transportation to the airport does not exist, except for taxis. These tend to be more expensive than regular service taxis, however. LCC Bus Route 1 takes passengers from the airport roundabout, which is located one kilometer from the terminal, to Rue Sadat in Hamra, whereas Route 5 takes to the Charles Helou bus station. OCFTC buses number seven and ten also stop at the airport roundabout, en route to central Beirut. The airport has two three ground handling operators, Middle East Airlines Ground Handling (MEAG) Lebanese Air Transport (LAT) and trans Mediterranean Airways (TMA). Middle East Airlines Ground Handling (MEAG) is a wholly owned subsidiary of the national carrier, MEA. It provides ground handling services for the national carrier, MEA, as well as most of the carriers serving the airport, including the cargo carriers. MEAG handles nearly 80% of the traffic at the airport. Lebanese Air Transport (LAT) is a smaller ground handling operator that conducts ground handling operations for a number of carriers serving the airport. LAT specialises in handling charter flights, but do have contracts with a number of scheduled carriers such as British Airways. Once upon a time, LAT was an airline that operated its own aircraft, however this was many years ago. The airport is home to four fixed-base operators (FBOs) for private aircraft. MEAG recently launched its own FBO services with the opening of the new General Aviation Terminal called the Cedar Jet Centre, now regarded as the airport's top FBO. Another leading FBO is Aircraft Support & Services, which specialises in fixed-base operator services for private and executive aircraft. In addition, they operate two executive jets that can be chartered to various places. JR Executive operates a fleet of small propeller aircraft that can be chartered or leased. They also have a flight school. They also conduct light maintenance on light aircraft and also offer fixed based operator services. Cirrus Middle East, a member of the German Cirrus Group, is partnering up with Universal Weather and Aviation to create a fixed-base operator and VIP charter service to be launched on 15 October 2012. The company will initially be called Universal/Cirrus Middle East, but will eventually become Universal Aviation Beirut. They aim to become one of the top FBOs in the Middle East and will cater aircraft as large as Boeing 747s. LAT offers limited fixed-base operator services for private and executive aircraft. Executive Aircraft Services offers aircraft charter services, ground handling services, aircraft management, and aircraft acquisition and sales. The airport is the home base of MidEast Aircraft Services Company (MASCO), an aircraft maintenance provider that specialises in Airbus maintenance, particularly the A320 and A330 series. It is a wholly owned subsidiary of the national carrier, MEA. MASCO has JAR 145 approval and as a result can maintain any aircraft registered in Europe. Middle East Airlines has its corporate headquarters and training centre at Beirut Airport. On 21 November 1959, Ariana Afghan Airlines Flight 202 crashed near Beirut on a flight from Beirut to Tehran, killing 24 of the 27 passengers and crew on board the Douglas DC-4. On 23 February 1964, Vickers Viscount SU-AKX of United Arab Airlines was damaged beyond economic repair in a heavy landing. On 30 September 1975 a Tupolev Tu-154 of Malév Hungarian Airlines, Malév Flight 240 crashed into the sea while approaching the airport. The cause and the circumstances remain mysterious, but it was most likely shot down. In September 1970, Pan Am Flight 93 was hijacked while flying to New York. The plane landed to refuel and pick up another PFLP hijacker. It was then flown to Cairo where it was blown up. On 17 May 1977 – Antonov An-12, SP-LZA, a cargo plane leased by LOT Polish Airlines from the Polish Air Force along with its crew, flying to Lebanon with a cargo of fresh strawberries crashed 8 kilometers from Beirut airport, all 6 crew members and 3 passengers on board were killed. The airplane crashed due to language problems, the crew repeated the order to descend given by the air traffic control and flew into a mountain. On 23 July 1979, a TMA Boeing 707-320C, on a test flight for 4 copilots due to be promoted to captains, crashed whilst on a third touch-and-go. The plane touched down but then yawed right to left to right again before the wing clipped the ground causing the plane to flip and come to rest inverted across a taxiway. All 6 crew members were killed. On 8 January 1987, Middle East Airlines Boeing 707-323C OD-AHB was destroyed by shelling after landing. On 25 January 2010, Ethiopian Airlines Flight 409, bound for Addis Ababa, Ethiopia and carrying 90 passengers (of which 54 were Lebanese) crashed into the Mediterranean Sea shortly after take-off, killing everyone on board. ^ Myre, Greg; Erlanger, Steven (13 July 2006). "Israelis Enter Lebanon After Attacks". Retrieved 2 June 2017 – via NYTimes.com. ^ "CNN Report: Israeli warplanes hit Beirut suburb". Cnn.com. ^ "Flights to Lebanon to resume soon". Retrieved 4 June 2015. ^ "Air Arabia launches Beirut – Sharm El Sheikh flights". rustourismnews.com. Retrieved 5 July 2018. ^ a b c "Flight Schedule". sunexpress.com. 28 October 2018. ^ "EGYPTAIR CARGO". www.egyptair-cargo.com. Archived from the original on 6 June 2017. Retrieved 2 June 2017. ^ "Luftverkehr auf Hauptverkehrsflughäfen" (PDF) (in German). Statistisches Bundesamt. 22 February 2018. Retrieved 30 July 2018. ^ Bilal Hamidi, Employee At Opentech. "مواقف السيارات". Retrieved 4 June 2015. ^ "World Airline Directory." Flight International. 26 July 1980. 330. "Head Office: PO Box 206, Beirut International Airport, Lebanon." ^ "TMA 1979 crash". Aviation-safety.net. ^ "Criminal Occurrence description". Aviation Safety Network. Retrieved 26 January 2010. ^ "Ethiopian plane crashes off Beirut, 90 feared dead". Reuters. 25 January 2010. Archived from the original on 22 July 2010. Retrieved 29 July 2010. ^ "Ethiopian Airlines plane crashes into Mediterranean sea". The Daily Telegraph. London. 25 January 2010. Retrieved 26 April 2010. Airport information for OLBA at World Aero Data. Data current as of October 2006.